"Value stream mapping has evolved from its roots as a tool used by geeks to reimagine and reconfigure manufacturing operations to a process to enable deep organizational intervention and transformation. 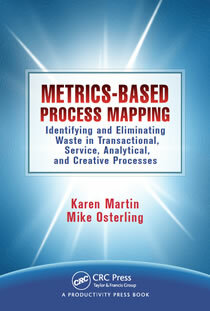 With Value Stream Mapping, Karen Martin and Mike Osterling provide an outstanding guide for practitioners engaged in the challenging work of improving the horizontal flow of value across organizations." "Despite decades of viewing value stream mapping as the core tool of Lean transformations, there is still confusion. Karen and Mike put mapping in its proper perspective as a methodology for getting high-performing teams to see waste, share a future state vision, and build meaningful actions that are carried out with passion and purpose." "I have been advocating, implementing and teaching kaizen within our company for 12 years. I have read many excellent theoretical books that describe the power of kaizen but this is the first that will actually give the reader a step-by-step process for facilitating events from planning through completion and follow-up. This book is a must resource for all Lean experts and facilitators." "Martin and Osterling provide an easy to read, practical guide to planning and executing kaizen events. In addition, they provide numerous checklists and other useful tools to help the reader begin to develop a ‘culture for kaizen’ in his or her own organization which is the ultimate goal of any Lean Enterprise." "Karen Martin and Mike Osterling have captured a succinct genealogy for Lean thinking and combined that with real working tools that will help orchestrate very effective continuous improvement events." "The Kaizen Event Planner illuminates the organizational details of how kaizen is actually executed in the workplace and delivers a step-by-step roadmap for starting the long journey towards building a cross-company culture of continuous improvement." Value Stream Mapping - an essential but under-used methodology - is a proven approach to help you visualize and resolve disconnects, redundancies, and gaps in your value delivery system. More than merely a tool to eliminate operational waste, value stream mapping is a highly effective means to transform leadership thinking, define strategy and priorities, and create customer-centric work flow. In this detailed guide, business performance improvement experts Mike Osterling and Karen Martin present a practical way to deeply understand how work gets done - in any environment - and how to design improved work systems. 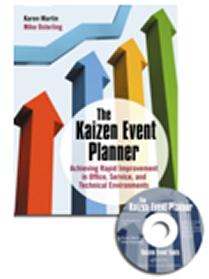 The Kaizen Event Planner is a practical, how-to guide for planning and executing Kaizen Events in non-manufacturing settings, and conducting post-event follow-up to sustain the changes made. Geared to continuous improvement professionals and leadership within the office areas of manufacturing, the service sector and knowledge-worker environments, this book provides the methodology and practical tools for generating measurable results, while building a motivated workforce and laying the foundation for continuous improvement. Metrics-Based Process Mapping (MBPM) is a tactical-level, visual mapping approach that enables improvement teams to make effective, data-based decisions regarding waste elimination and measure ongoing process performance. The mapping technique, often used to drill down from a value stream map, integrates the functional orientation of traditional swim-lane process maps with time and quality metrics that are essential for designing improved processes. The CD provides improvement teams with an Excel-based solution to electronically archive and distribute current and future state MBPMs created with paper and Post-it® notes. See the attached pdf for an overview of how this tool can save you countless hours when documenting your processes. From A3 to WIP, this glossary provides a standard understanding of the lean terminology. A suite of Excel-based lean templates to document your continuous process improvement activities and results. Mike Osterling joins other podcast guests including industry thought leaders Michael Ballee, Drew Locher, Mark Graban and more! Listen in as Mike addresses the power and challenges of moving kaizen events off the shop floor and into the office.